Most people would arrive in Amsterdam via the central train station, either from a train from Schipol airport, other European destinations or one of the many coaches that bring daily visitors from many of the North Sea Ferries. The first thing you will see on the exit doors of the station will be the now famous Amsterdam trams, boat tours a bit further on and to the right, a cycle park that must contain a half a million bikes. Three things associated with Amsterdam. Visitors to The Netherlands rely on Marriott Amsterdam for functional accommodations and impressive amenities. 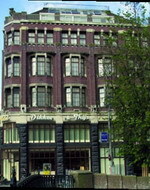 Featuring an unbeatable location, the smoke-free hotel is across the street from Leidseplein, where guests enjoy numerous shops, restaurants and bars. The Van Gogh museum is also within walking distance, and a boarding point for Amsterdam Canal Tours is directly outside the hotel. Marriott Amsterdam offers several dining options, including steaks and seafood at Quoy Restaurant and terrace dining at Characters Bar & Grill. Guests appreciate complimentary newspapers and fresh coffee in the welcoming lobby, and on-site laundry facilities assist with any potential wardrobe problems. Other amenities include premium movie channels, feather pillows and coffeemakers. 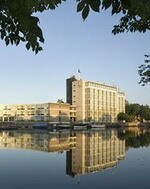 Marriott Amsterdam offers practical accommodations to European adventurers desiring worry-free journeys. 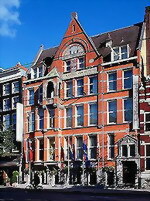 The Best Western Apollo Museumhotel Amsterdam City Centre is located in Amsterdam, The Netherlands, 100 metres from the Vondelpark, 200 metres from the Rijksmuseum, and 400 metres from the Van Gogh Museum. Amsterdam Central train station is two kilometres away. 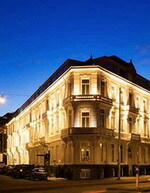 This city hotel occupies a corner building and features scenic views over the designer shopping street, De P.S. Hooft. There is a contemporary-styled bar on site. Complimentary wireless Internet is offered throughout the building. A water taxi leaves directly outside the hotel. Continental breakfast is available to guests of the Apollo Museumhotel (surcharge). The Salada Samba restaurant can be booked for groups of over 20 people - contact the hotel for more details. Coffees and typical Dutch beers are offered at the bar. There is on-street parking next to the hotel and parking lots at the nearby Museum Square. Located on the picturesque Prinsengracht canal, with its unspoilt, 17th-century architecture and quaint cobbled streets, the Dikker and Thijs Fenice hotel is set in a renovated 17th-century building, 50 metres from Leidseplein. Amsterdam Schiphol Airport (AMS) is 20 kilometres away, approximately 30 minutes' drive. Each morning guests can enjoy a Dutch buffet breakfast (surcharge) in the atmospheric dining room, featuring original stained-glass windows, turn-of-the- century dark wood furnishings and a ceiling characterised by exposed wooden beams and Venetian chandeliers. Downstairs, guests can unwind with a drink in the evening in the candlelit bar. Wireless Internet is available throughout the hotel, while those without laptops can use the Internet corner with PC (surcharge). Canal trips are available a block from the hotel, including city tours and night cruises. Visitors can also hire bikes three blocks away to explore Amsterdam and the nearby Vondelpark. The Eden Rembrandt Square Hotel is located in Amsterdam, Netherlands, 50 metres from the Amstel River, and one kilometre from Dam Square. Surrounded by bars, cafes, and busy shopping streets, the Eden Rembrandt Square Hotel is a five-storey city centre property with contemporary decor and modern artwork. Amenities include a restaurant and bar. Multilingual staff at the 24-hour front desk can also assist with travel and tourist arrangements and provide currency exchange. 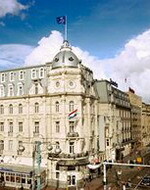 Internet access is provided throughout the hotel, and room service is available during restaurant opening hours. Porters are on hand for the transfer of luggage, and parking is available nearby. Brasserie FLO Amsterdam captures a Parisian atmosphere with its Impressionist murals, white table linen, and windows looking onto the bustling street. Lunch and dinner menus feature a selection of modern French cuisine and a Fruits-de-Mer buffet with fresh oysters, crab, and lobster. Light snacks and a variety of wines, spirits, cocktails, and beers are offered in the lounge bar. Overlooking a junction of five canals, this waterside hotel is a peaceful retreat two blocks from the RAI Congress Center and World Trade Center; Vondelpark and museums are under one kilometre away. The nearest airport is Amsterdam Schiphol, 20 kilometres away. The Golden Tulip Apollo Amsterdam is two blocks from the RAI Congress Center and a 10-minute walk from the Rijksmuseum and Van Gogh Museum. The hotel has a seafood restaurant with scenic canal views and a lounge with two terraces overlooking the marina. The fitness center is a spacious room with exercise machines, free weights, hardwood floors, natural lighting, and television. The Golden Tulip Apollo has two restaurants: La Sirene, which is a nautically-themed venue specialising in fresh seafodd; and the more informal Lounge, serving light meals and extending onto the waterside terrace when the weather permits. 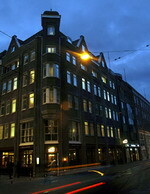 The unique Hotel Pulitzer, made up of 25 converted canal houses, is 500 metres from Dam Square in the centre of Amsterdam in the Netherlands. 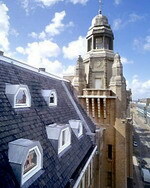 Famous attractions like Anne Frank House and Kalverstraat shopping street are 500 metres away, as is Centraal Station. 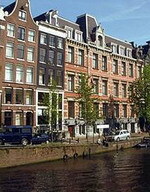 The Hotel Pulitzer consists of 25 traditional 17th- and 18th-century houses overlooking the Prinsengracht canal. A warren of corridors and courtyards uncovers many original features, with baroque plasterwork, marble staircases and wooden beams throughout. The lobby is filled with leather armchairs, plump sofas and flower arrangements. The Hotel Pulitzer's restaurant, originally an apothecary, offers breakfast, lunch and dinner in a contemporary setting featuring a nine-metre modern version of 'The Last Supper'. The Bar at Hotel Pulitzer is made up of three intimate lounges, with midnight blue decor and low grey armchairs. 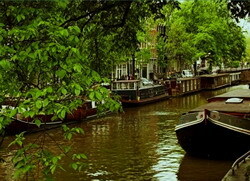 It enjoys views out over the Keizergracht canal. The Rendez-Vous serves drinks and light meals in the lobby lounge or the courtyard. The hotel offers complimentary access to the well-equipped gym, with free weights and cardiovascular machines. The 1920s Lloyd Hotel is in Amsterdam's fashionable East Docklands within one-and-a-half kilometres of Centraal Station, and five kilometres from the Rijksmuseum. The nearest tram stop is 200 metres away. Hotel Features. A former 1920s boarding house, Lloyd Hotel has been completely renovated, combining its grey stone exterior, tall windows and other original features with striking design. Throughout the hotel, open spaces and low-lit corridors are filled with artwork. Snel is Lloyd Hotel's bustling, airy restaurant, painted in white with contemporary furnishings, and with a terrace for alfresco summer dining. Open all day, and popular with guests, locals, artists and business people, it serves classic European dishes. Home to the Cultural Embassy, Lloyd Hotel acts as a cultural exchange, with ample space for exhibitions, performances, informal artists' gatherings, meetings and functions. There is complimentary wireless Internet access throughout, and an Internet corner with a PC and high-speed Internet access. The Novotel Amsterdam City is located in Amsterdam, Netherlands, four kilometres from Van Gogh Museum, and five kilometres from the centre of Amsterdam. 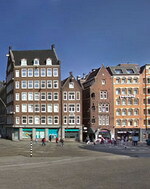 Anne Frank House is 5.5 kilometres from the hotel. The hotel has a cafe and an English pub on site. Seven meeting rooms are available on site, and the hotel's public areas all have wireless Internet access and air conditioning. 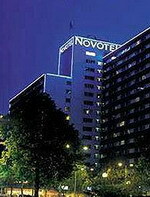 Novotel Amsterdam City's restaurant serves international dishes. The hotel's 611 guestrooms all offer satellite television, pay movies, direct-dial phones, voicemail, wireless Internet access, hair dryers, and minibars. 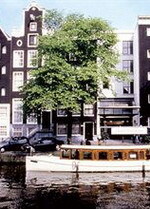 The Rembrandt Classic is a canalside hotel set in 17th and 19th century canal houses and located on the Herengracht, behind Dam square. 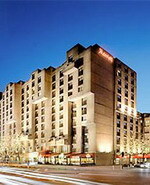 The 111 guestrooms have modern decor and include satellite television and direct-dial phones. A range of snacks and drinks is available in the hotel bar and from room service. For the business traveller, the hotel has meeting rooms and offers fax, photocopying and outgoing mail services. Multilingual staff at the 24- hour front desk can assist with organising trips around the many local attractions and make theatre, concert or restaurant reservations. Many of the city's major attractions, including Anne Frank's House, the flower market and Amsterdam Historical Museum can be found within 500 metres of the hotel. Amsterdam Schiphol Airport is 20 kilometres away, a drive of approximately 30 minutes. The Swissotel Amsterdam hotel in Amsterdam, Netherlands is conveniently located to shopping, area attractions and entertainment. 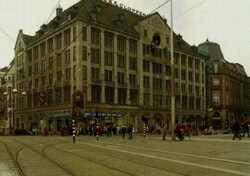 Around the corner from the hotel are Dam Square, the Royal Palace and De Bijenkorf, Amsterdam's best-known department store. Vondelpark is less than three kilometers from the hotel. Amsterdam Central train station is three blocks from the hotel and Schiphol International Airport is 19.0 kilometers away. The Swissotel Amsterdam includes amenities like multilingual staff and a 24-hour front desk. Dam Plaza restaurant is open for breakfasts, lunches, dinners or drinks. The hotel offers a fitness room containing cardio-vascular equipment. A 24-hour business center is equipped with a computer station with complimentary high-speed Internet access, printer and fax.